Michael R. Buchmeiser was born in Austria and received his ph.D. in Inorganic Chemistry at the University of Innsbruck, Austria. He then spent one year at MIT as Post-Doctoral Fellow within the group of R.R. Schrock. In 1995 he accepted a position as Assistant Professor at the University of Innsbruck where he was appointed Associate Professor for Macromolecular Chemistry in 1998. His research interest mainly focus on transition metal catalyzed polymerizations, homogeneous and heterogeneous catalysis as well as opto-electronic applications of smart polymers. 1. Structure, Morphology, Physical Formats and Characterization of Polymer Supports (Y. de Miguel, et al.). 2. Supported Reagents and Scavengers in Multi-Step Organic Synthesis (I. Baxendale, et al.). 3. Organic Synthesis on Polymeric Supports (C. Gil, et al.). 4. Solid-Phase Bound Catalysts: Properties and Applications (T. Frenzel, et al.). 5. Soluble Polymers as Catalyst and Reagent Platforms: Liquid-Phase Methodologies (T. Dickerson). 6. Polymers for Micellar Catalysis (O. Nuyken). 7. Dendritic Polymers as High-Loading Supports for Organic Synthesis and Catalysis (R. Haag & S. Roller). 8. 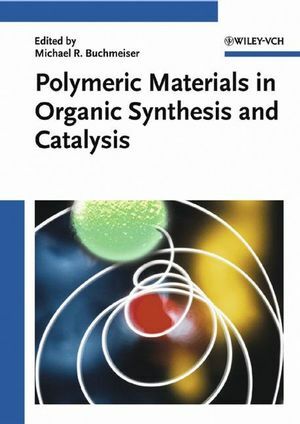 Metathesis-Based Polymers for Organic Synthesis and Catalysis (M. Buchmeiser). 9. New Strategies in the Synthesis of Grafted Supports (R. Jordan). 10. Biocatalyzed Reactions on Polymeric Supports: Enzyme-Labile Linker Groups (R. Reents, et al.). 11. Polymer-Supported Olefin Metathesis Catalysts for Organic and Combinatorial and Synthesis (J. Kingsbury & A. Hoveyda). 12. Monitoring and Optimizingn Organic Reactions Carried Out on Solid Support (B. Yan). 13. Polymeric Membranes for Integrated Reaction and Separation (J. Keurentjes).